Caspian Energy (CE): Mr. Akhundov, Caspian Marine is currently one of the largest shipping companies in the region, is not it? Ilham Akhundov, Shipbuilding Manager at Caspian Marine Services Ltd: Yes, it is one of the largest shipping companies in the region. We have been working in Azerbaijan for more than 10 years. The Company has its fleet of vessels and at the same time operates vessels of other ship owners, resorting to their modification, if necessary. Modification is carried out according to the technical requirements of our customers in the Caspian. Basically, we serve the oil and gas industry, that is, the platforms that produce oil in the Caspian Sea for SOCAR and for oil consortiums. At present, about 30 vessels operate under our operatorship. Of these, 19 belong to our Group of Companies, the rest are operated jointly with the Caspian Shipping Company under the Alliance Agreement. CE: Which problems does the Company face given that the Caspian is the enclosed water body? Ilham Akhundov: You know, this does not affect our activity in any way. Our vessels are moving freely across the Caspian and along the Volga towards the Black Sea according to the international navigation rules. We do not see any problems in this. CE: How did the signing of the Convention on the Legal Status of the Caspian Sea affect the Company? Ilham Akhundov: Nothing will change for seamen. Seamen do not have maritime boundaries. For shipping companies the main thing is that our vessels operating in the Caspian Sea should have no problems crossing the border with other Caspian countries. CE: Do you face technical problems with shipping operations that require solutions at the level of the Governments of the Caspian countries? Ilham Akhundov: No, we do not. Only in winter time the northern part of the Caspian Sea is covered with ice and only then navigation through the Volga is suspended and resumed only in the spring. From November to April we do not have navigation across the Volga, and therefore the corresponding action plan is drawn up in a way that enables to complete it before the first frosts. CE: Which Caspian Sea countries would you like to cooperate with more actively? 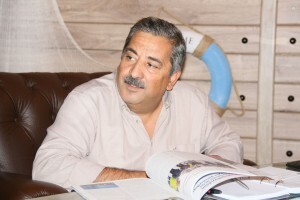 Ilham Akhundov: Our Company takes an active part in international exhibitions on maritime topics hosted in Baku, as well as in Europe, Middle East and in the Caspian Sea countries. During such exhibitions we have already established contacts with the shipping companies of Russia, Kazakhstan, Turkmenistan and Iran. They showed interest in cooperation with our Company on a number of projects. Since the shipping companies of these countries do not have such fleet of specialized vessels like ours, they apply for our help, if necessary. We have the office in Astrakhan and in the long term we plan to open offices in Kazakhstan and other regions. CE: Which big companies do you cooperate with? Does your Company have ambitions to enter the world markets? Ilham Akhundov: If we had not have ambitions, probably we would not have achieved such a high level of shipping services as we have today. In 2006, when we started working, our Company had only 7 office employees. With the expansion of activities, the number of the management personnel has reached 23, and at the moment our office staff totals over 70 people. During the past period we were able to upgrade and modernize the Gurban Abbasov crane barge into a multi-purpose marine facility capable of accommodating more than 200 people of the special personnel. Over the past 10 years, we have built small passenger and cargo ships, dredging vessels and modified tugsupply vessels. The Muslim Magomaev and Rashid Behbudov high-speed crew catamaran vessels with the aluminum hull were built at the shipyards of Australia. To ensure safe personnel access to offshore platforms, these ships are equipped with telescopic gangways, where the software control system processes and offsets the force of sea waves and wind. It enables to deliver people to their workplaces in a quick and safe way even in the rough sea conditions. CE: Has CMS changed its safety standards after the tragic events at the Gunashli field? Ilham Akhundov: Our Company has all necessary recognitions and introduces the improved safety standards in the marine industry. Moreover, having such oil giants as SOCAR, BP, and TOTAL in the list of our customers, we constantly worked and keep working to improve the quality management standards of our Company. At the same time the employees of our Company regularly attend training and refresher courses both in the country and abroad, enriching their knowledge and skills. This is done, among other things, because new technologies require a special approach to improving the skills of seafarers and company employees. It was the good preparation and possession of high-tech knowledge in the field of navigation, as well as the telescopic gangway installed at the Muslim Magomayev vessel, that prevented the possibility of expanding the scale of the tragedy on the Gunashli platform. As you know, the remaining oilmen on the platform were rescued with the help of the Muslim Magomayev vessel. CE: This is not surprising, the ship with such a name could not have acted differently … It turns out that if the number of such ships had been bigger, they would have saved everyone? Ilham Akhundov: Given such rough sea conditions and wind, the problem cannot be solved by just a number of ships. It was impossible to approach the platform either from the air, or from the sea. The only exception was the Muslim Magomaev vessel, since it has a telescopic gangway that operates in conjunction with the Dynamic Positioning System maintaining a ship’s position at sea. This enabled us to mitigate the magnitude of this tragedy. In that period (2015) we were already building the second vessel, Rashid Behbudov ship. This accident once again confirmed the urgency of the security issue at offshore facilities. At the same time the operations performed from the Muslim Magomaev vessel proved that such technologies, if used, enable to either prevent or minimize a possibility of unforeseen tragic accidents at sea. When we delivered the second Rashid Behbudov crew vessel to the region, we started getting inquiries from different countries about the possibility of renting such vessels. A huge number of companies contacted the shipyard in Australia because they wanted to learn about our project. If you look at what the world media is saying about the Muslim Magomayev and Rashid Behbudov crew vessels courts, then you will make sure that these vessels are the world’s pioneers of applying high technologies, that is, in terms of combining appropriate devices and technologies. We can say without exaggeration that we are proud that the first vessel of this type belongs to our Company. CE: How did the crisis affect your Company? 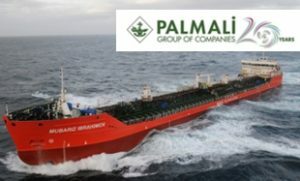 Ilham Akhundov: We faced some difficulties, in particular, we wanted to increase the number of new vessels for our Company, but due to the drop in oil prices, the general economic situation also affected a little bit our plans. Depending on particularity of offshore projects, it sometimes seems more expedient to modify the existing ships, rather than build new ones. However, I believe that for the upcoming deep sea operations we need to equip our fleet with vessels with the appropriate technical characteristics. Ilham Akhundov: It depends on a final destination of a vessel. If a vessel is adapted to possibilities of its modernization to the level of modern vessels standards, it is not worth to say that a ship has outlived its time. Our Company has recognitions in the management of many types of vessels, including sea tankers. Our new tankers Professor Aziz Aliyev and Ganja cruise to the Black Sea. CE: Can they be used for the Kashagan project? Ilham Akhundov: The so-called specialized service fleet is used at Kashagan. Various companies contacted us, requesting to provide operational services at this field. In this field our Company is a recognized leader in the region, since we have highly qualified personnel and operate according to the highest global standards. CE: What could you say about the Great Silk Road, the North-South project? How will these transport routes impact the performance of the Company? Ilham Akhundov: To date, we serve only oil and gas platforms. We do not have a transport fleet. If we receive an order to transport a certain cargo across the Caspian Sea, then of course we will be able to provide such services. Our main goal is to work with oil consortia. At the moment we have a new project with Total. Due to the prolonged oil price crisis on world markets, the oil companies reduced their budgets, and accordingly we suspended the construction of new offshore facilities. Ilham Akhundov: I would like to wish the State Oil Company of the Republic of Azerbaijan great successes in entering these markets, which, in turn, can contribute to expansion of both our activities and our fleet, as the markets of these countries are quite developed. Ilham Akhundov: Yes, there is some truth in it. Our company is actively considering both short-term and long-term prospects for Caspian Marine Services at the international markets which are beyond the Caspian Sea. CE: As President of Azerbaijan Ilham Aliyev repeatedly said, Azerbaijan’s economy will be more competitive only via the development of small and medium business, particularly, in the world arena. Do you think that economy now depends mainly on competitiveness of the private business but not on big companies? Ilham Akhundov: Yes, we have potential and prospects to be more competitive on the international markets (regional ones for now). However, entry of the vessels from the Caspian to the neighbor regions is difficult because of their sizes, which limits our opportunities. CE: What are the prospects of operating, for instance, in the Persian Gulf where an active oil-gas production is running, for instance, in Qatar and Iran? Ilham Akhundov: Yes, there is plenty of work in this region. Our company is actively represented in all the exhibitions hosted in this region, mainly in Dubai and Abu Dhabi. We could work with Arab companies which are in need of small-size vessels, crane ships. But they work mainly with local companies. Fulfillment of operations for a specific project often requires construction of a new or re-equipment of the fleet precisely for a certain project in the region itself. CE: There is a trend among world shipping companies to shift to environmentally clean fuel – liquefied gas-operated engines which do not cause emission into the sea … What is the situation with it at the Caspian vessels? Ilham Akhundov: Our vessels have been equipped with special devices which reduce emissions into the atmosphere. Shift of engines to liquefied gas will take time to create a relevant infrastructure and work out concrete approaches for the settlement of the problem. When I was in Australia I saw passenger vessels using environmentally clean fuel. That is to say, vessel gas turbines operate on liquid natural gas. Environmentally clean fuel is used on certain cruise ships in the Pacific Ocean. It is not used in industry as it requires huge expenses and high safety, which may bring to unprofitability of certain production sector. Another approach is needed here – comprehensive, that is to say, we need to analyze the performance of the entire system. CE: If Presidents of 5 Caspian countries gather and decide to shift to environmentally clean fuel… How real does it sound? Ilham Akhundov: It depends from which standpoint each Caspian country is going to address this matter. Ilham Akhundov: As fas as I know, an issue of development of the tourist route along the Volga and Caspian is under active discussion now. If the parties reach an agreement, then we can start talking about the use of environmentally clean fuel. It will require changes in the construction of vessels, replacement of diesel engines with gas turbo compressors. The highest security requirements will have to be observed in order to use gas turbo compressors. At present, we are carrying out our activity on basis of the requirements of International conventions. That is to say, we have focused all our efforts and potential on meeting major requirements of the maritime international convention for the safety of life at sea and convention for the prevention of pollution of the Sea (Marpol 73/78) including its latest amendments. These conventions show concrete dates when old and under construction vessels should be equipped with relevant technology making it possible to meet ecological requirements. In this respect, we should also prepare a young generation for shift to new standards. For several years now, students of the Azerbaijan State Maritime Academy have been successfully doing practical training at the vessels of Caspian Marine Services. Among employees of our company we have marine professionals who teach at ASMA and regularly participate in science-technical activities, giving lectures about maritime field. At the same time, I would like to note in particular that the wish to become a sailor in present generation of young people is growing day by day. We realize that the task of representatives of our generation is to convey all knowledge and experience we gained through these years to our young sailors and become their reliable mentors.